I’m a sucker for good G.I. Joe artwork. As such, you can imagine my reaction when I saw the following poster on Larry Hama’s Facebook page a few days ago. 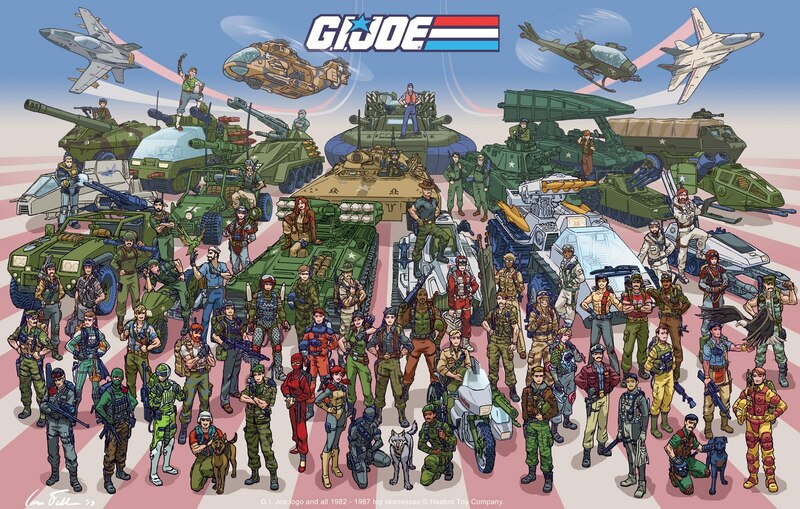 This image is literally a “who’s who” of the Joes that I grew up with. From Gung-Ho to Clutch to Keel Haul, it’s a complete roster of my favorite era of Joes. (1982 – 1987) This was the era of Sunbow and the time frame in which my attention was FIRMLY focused on the world of A Real American Heroes. It’s also the most “military” era of the 1:18 franchise IMHO. I wanted to create something as a Thank You for all the work that has gone into G.I. Joe, an inspiration for me since I was a kid. This composition was inspired by Michael Golden’s G.I. Joe Yearbook #1 cover, Joes included are from 1982-1987. I handed a few of these out at the convention, and I hope the recipients enjoyed them. Thanks to everyone who keeps the Joes going! My wife calls this piece “Where’s Wal-Joe?” Can you spot the Joes that are missing? (I’m hoping to add them in an updated revision. I ran out of time!) Click the image to see a larger version. Normally, if I want a copy of an image like this I have to find the highest quality version I can online and settle for it serving as my desktop wallpaper for a few weeks. However, the artist doesn’t seem content to leave my walls bare. He’s currently offering copies of this amazing image online– FOR COST! That’s right– for the cost of materials and shipping, a quality semi-gloss stock 11″ x 17″ copy of this image can adorn your wall– for a whopping $5.00. That’s less than the cost of an extra-value meal at your favorite fast food joint. Even better– Ian’s indicated that a Cobra version might be on the way. To your order copy, visit IanFell.com and add this beauty to your wall!